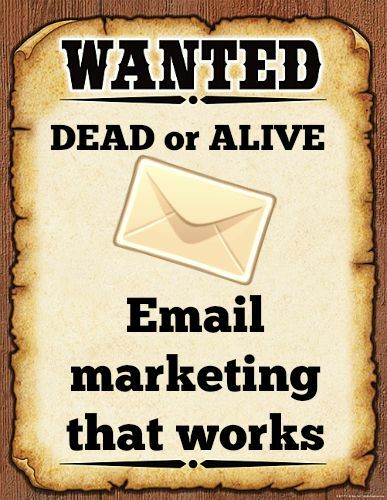 Is email marketing really dead? Can you improve email? The marketing Hatfields and McCoys are feuding. The Hatfields tell you email marketing is dead and everything is moving to social media. The McCoys say email is a vital part of everyone’s marketing plan. I say don’t do email marketing if you can’t do it right. So here are 10 steps you need to follow to improve email marketing. Gone are the days of doing email blasts where you send the same message to all 62,352 people on your email list. We are bombarded daily by advertising and we’ve become very good at tuning out the messages that don’t catch us quickly. Divide your list into groups such as your top 20 customers, shoppers who attended a special event, younger customers or customers who only buy a specific brand, etc. Let’s face it, you have 6 seconds to grab my attention. Put some thought into your subject line. Short and catchy. Use lists if possible. Create urgency, but never use ALL CAPS. Send your emails from your name not your business. As you will see in #4, the goal of emails is to build relationship. By sending your emails with your name, you are putting yourself out there as a real person they can connect with. Unlike the Hatfields and McCoys, your goal should be to “improve” the life of the email recipient. Whether it’s saving them money, making them smarter or entertaining them, make sure you’re offering something of value. Whenever possible, generate emails using the receiver’s first name (this always boosts the open rate) and use conversational language. Your goal is to be a friend helping a friend. Emails coming from your shop should be immediately recognizable. Your email style and design should always have regular elements like your logo, your address and phone number in a consistent location and a recognizable color scheme. There should be no doubt in the reader’s mind what action you’re wanting them to take. If it involves redeeming a coupon, make it very clear they must print it off and bring it in. If it’s time sensitive, make sure those dates are bold and stated several times. Always provide a way for you to be contacted if there are any questions. Studies show that emails with images always generate more interest. Use an image of your shop or salespeople to once again build a relationship with the reader. Include an image of merchandise so they get a feel for what you’re offering. Knowing the exact time an email should be sent can be the trickiest part. You have to know your audience. Are they employed full-time? Then, I wouldn’t send them at 9 am so they are buried in multiple home emails. Are they stay-at-home moms? Then, sending them in the afternoon either during nap time or before the kids come home may be the best. It’s trial and with a lot of error. Now, more than ever, shoppers are using their cell phones to check their emails. Use a single-column layout. Keep messages concise and use only one image at a time. If your emails are personable, something I’m interested in and offer me value, I am thrilled to see them in my inbox more than 1 or 2 times. In fact, I need those reminders so I’ll show up in your shop at the right time.